Windows 10 is great compared to all previous Windows versions. But it suffers from the same problem as all its predecessors – it becomes slow over time. Not only that, but it easily gets corrupted and starts displaying errors that come out of nowhere. While you can fix most Windows problems manually if you have sufficient knowledge of the OS, it’s a lot easier, safer and quicker to use a PC optimizer that does it all automatically. 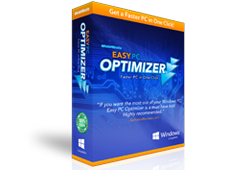 Easy PC Optimizer is a new program that can make Windows faster, fix nasty errors, help you manage your files and more. Let’s check it out! 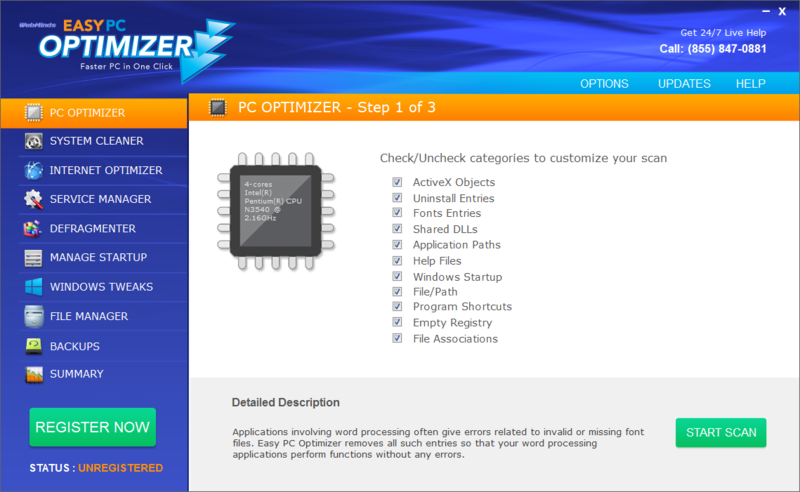 Easy PC Optimizer has nine different tools to clean up, speed up, optimize and customize your PC. Let’s have a look at them one by one. PC Optimizer is the module you see when you run the app. Basically, it’s the overall system scanner that checks your Windows for errors, registry problems and other issues. You can customize the scan by checking and unchecking categories, or you can let Easy PC Optimizer do its job and perform a complete system scan. Resolving the issues is as easy as clicking on a button because everything is done automatically. The system cleaner is the tool for getting rid of all sorts of junk files that accumulate on your computer. It can find and clean up all types of system and application temporary files, empty your Recycle Bin, as well as clean up your PC usage history. This is a really cool tool because it can make your computer use your Internet connection more efficiently and thus speed up browsing. Basically, the Internet Optimizer checks your Internet connection and then modifies default Windows settings so that you get the optimal fit. By default, Windows runs lots of different system services that an ordinary home user doesn’t need. Easy PC Optimizer’s service manager lets you select a usage profile and then optimizes your services so that services you don’t use don’t take up valuable system resources. A very handy feature. OK, I bet you’ve heard of registry cleaners. But did you know that your PC’s registry needs to be defragged from time to time? Because the registry is fully kept in the RAM, a fragmented registry takes up more space and makes your computer slower. That’s why Easy PC Optimizer comes with a registry defrag tool – to delete registry bloat and thus speed up Windows performance. An essential tool for every Windows optimizer, which lets you easily configure your startup list. The fewer apps load on system startup, the better. Just make sure you don’t disable anything important (not that Easy PC Optimizer will let you). This module not only lets you gain some speed but it also helps you easily customize the look and feel of your OS. There are lots of tweaks there that are otherwise hidden and hard to access. Ever wondered which files are taking the most disk space on your PC? With Easy PC Optimizer’s File Manager you can view your disk usage at a glance and easily delete or move any files. This is not really a tool because Easy PC Optimizer makes automatic backups of your settings just in case anything goes wrong. A must-have feature. 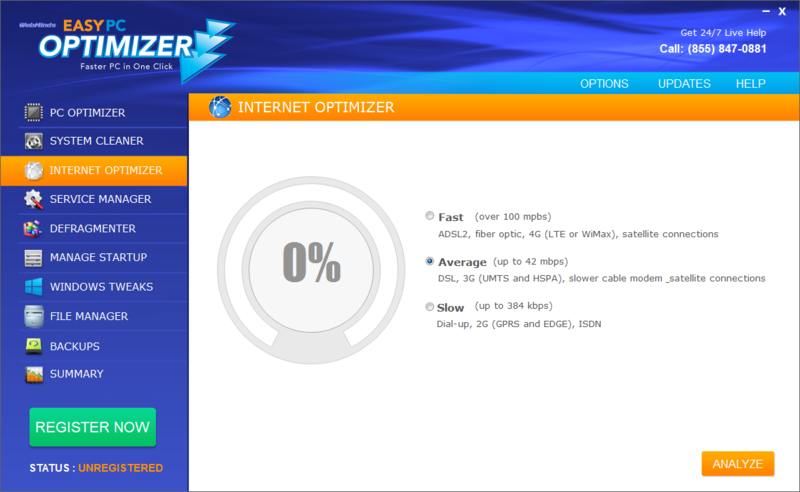 Just like the app’s name suggests, Easy PC Optimizer is very easy to use. Its interface is very straightforward and all features are easily accessible from the menu on the left. It also helps that the app is pre-configured for inexperienced PC users and applies fool-proof optimization techniques. It also has an “Analyze All” button, which basically lets you scan your PC in one click and then repair all problems in another click. Easy-peasy. If you do run into any problems, there’s a toll-free number you can call and get help. Easy PC Optimizer is free to try – it lets you scan your computer for all types of problems and review the results. The full version costs $29.97. Even though Easy PC Optimizer is a relatively new program, it has all the features to make your computer fast, responsive and error-free. It’s very easy to use and really does work (it did for me anyway). OK, it’s not a freebie but in my opinion, it’s worth the money.